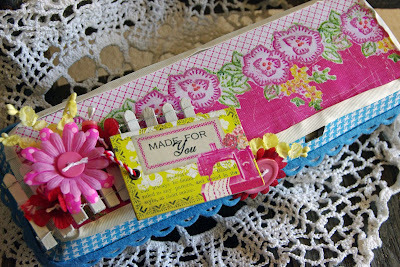 Amy is such a bright and cheerful person that when I found cheery vintage papers and embellishments from Melody Ross I knew I had to pick some up and create with it. 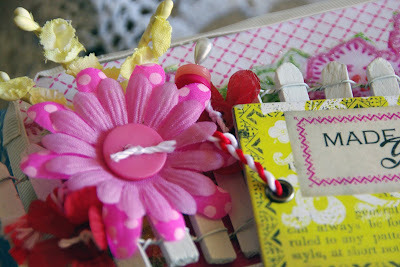 I just fell in love with the handmade tags and had to include a several inside and outside the egg carton. 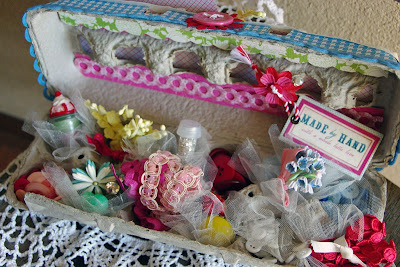 After decorating the egg carton inside and out, I filled it up with all kinds of goodies. 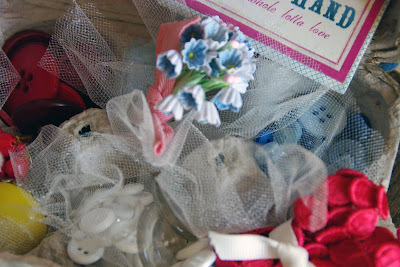 From buttons, petite flowers and yummy ribbons. I couldn't forget some bling, so I included a vintage rhinestone pin, vintage earrings and German Glass Glitter. I sure hope Amy enjoys all her goodies! Thank you Sandy for hosting such a wonderful swap. eeekk i love your egg carton. love the colors!! hope you are having a fantastic summer. Great way to recycle and it looks awesome!! Thanks for joning in Sheila and I just love your bright and cheery carton. 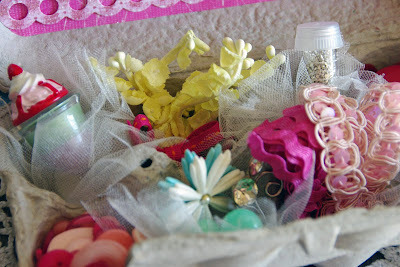 It definitely screams Amy!BTW, I was checking out 'Blogging for Bliss' and I saw your feature! I was so giddy and then when I saw my banner on the bottom of your page- my heart skipped a beat. What a delightful surprise! We sure have come a long way from when we first started out and swapped together 3 years ago!